If the referendum is approved, Turkey’s parliamentary system—established with the modern republic’s founding in 1923—would be scrapped in favor of an executive presidency; the position of prime minister would be abolished; and the role of parliament diminished and executive powers concentrated in the hands of the president. Unilateral presidential powers would include the ability to appoint high officials, issue decrees, declare states of emergency and dissolve parliament. President Recep Tayyip Erdoğan and the ruling Justice and Development Party (A.K.P.) he leads are pushing for the package of constitutional amendments alongside the far-right Nationalist Movement Party (M.H.P). The pro-Kurdish People’s Democratic Party (H.D.P.) is the effort’s most vocal critic with the moderate Republican People’s Party (C.H.P.) also supporting a “No” vote. The referendum will be held on April 16. Current polls show a narrow race between the two opposing camps. There is widespread concern that no matter the outcome, difficult times lay ahead for the highly polarized country. Mehmet Ugur, professor of Economics and Institutions at the University of Greenwich in England and an expert on Turkish affairs, is critical of the upcoming referendum and concerned by the “extraordinary situation” in Turkey as voting nears. Mr. Ugur worries that the conditions for a free and fair vote are sorely lacking. “It’s going to be a referendum where votes are cast under war conditions,” he says. Several Kurdish cities remain under strict curfew following intense clashes with Turkish military after the state suspended a peace process with the Kurdistan Worker’s Party (P.K.K.) in 2015. In the resurgent conflict, more than 2,000 people have been killed and the country’s southeastern region devastated. A report released on March 10 by the United Nations Office of the High Commissioner for Human Rights accused Turkey of using excessive force that led to the deaths of civilians, displacing upwards of half a million people and systematically destroying or expropriating property. Over 2,000 H.D.P. members, including its leaders and other members of parliament, have been arrested on terrorism charges. The party is largely unable to publicly advocate for its “No” position, given a media blackout and prohibitions on public assembly. Many displaced people in the southeast—the party’s stronghold—are unsure if they will be able to vote. 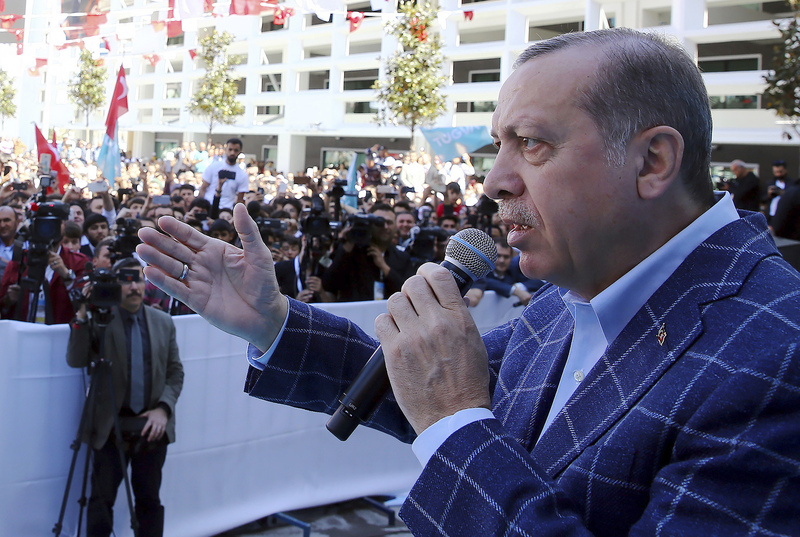 Turkey has been wracked in recent years by turmoil and violence. An attempted coup in July sent shockwaves throughout Turkish society. A far-reaching crackdown afterward saw as many as 125,000 people fired, over 35,000 jailed and hundreds of N.G.O.s and media outlets shuttered. Turkey’s military invaded Syria last August ostensibly to combat ISIS, but it has also clashed with Kurdish militias in Syria’s north. Mr. Erdoğan argues these overlapping challenges prove the need for an executive presidency streamlining decision-making and allowing a chief executive to better steer the country through crises. Critics, however, accuse him of seeking to consolidate his own power at the expense of what had been a more balanced democratic system. The Venice Commission, a body of constitutional law scholars advising the Council of Europe, added credence to this view in a report published on March 13. They found that the current political environment in Turkey “does not provide for the due democratic setting for a constitutional referendum” by international standards. The entire country remains under a state of emergency that had been declared after the attempted coup and prolonged by a series of deadly attacks allegedly perpetrated by ISIS. Mr. Ugur, an Alevi—a distinctive community closely related to Shia Islam—adds that the referendum will also affect religious freedom in Turkey, a region rich with diverse cultures and faiths but which has recently seen “a huge wave of nationalism, racism and hate speech” targeting its many minorities. Further deterioration will undoubtedly affect the over two million Syrian refugees currently hosted in Turkey. Mr. Ugur suggests that the A.K.P. government has been using those fleeing violence as “a bargaining chip” in its domestic and international agenda. Ryan Richardson is a contributor to America magazine.